Why plow through years of graduate school, labor nights and weekends, abandon your family in the name of science? Because one day, if you're very lucky, your work may be recognized by some prestigious international award committee. If you're only kind of lucky, though, you still might be able to snag an Ig Nobel. This year's esteemed spoof awards went to a range of research, papers and patents that met the tight criteria: "First make people laugh, and then make them think." Among the winners was the Air Force Wright Laboratory in Dayton, Ohio, which swept the Peace category for its research into a harmless, but doubtless hilarious, "gay bomb." The weapon, laden with aphrodisiac chemicals, would presumably make enemy soldiers so irresistible to one another that they would drop their weapons in favor of dropping trou. Oddly, no one attended to accept the prize. "Gay Bomb"- Is that what happened to my husband? After 20 months in Iraq he returned transgendered. Needless to say, it ended our 24 year marriage. vanilla from a cow dung?! Yes! The online pharmacy no prescription phrase works on two distinct planes; the internet and non prescription medication. But, we are fusing the phrase so that it means something and we can use the constituent parts of the phrase to create an idea. The concept of “online pharmacy no prescription” is designed for the purpose of providing medication over the internet (online) for all those people all over the world who are in dire need of suitable medication at reasonable prices, which is exactly the reason behind generic meds. being victim of the gay bomb must be shame issue that can occur in the world. Every year the ig nobel entertain us so much...this year with the gay bomb. The rat and the cockroaches of the galery makes me creazy, disgusting, but I liked the others images,thanks for the site. 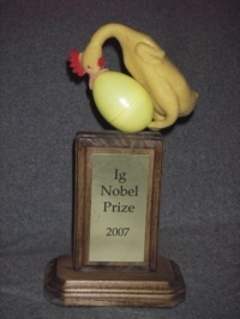 The Ig Nobel prizes doesn't have any sense, The real Nobel (watch Literature and Peace) prizes are more ridiculous . ... more ridiculous than Sarah Palin? Yeah, its eternal question, what was first, egg or chicken. Hi, great post. thank you!